The Americana Music Association has announced their nominees for the 2018 Americana Music Awards. 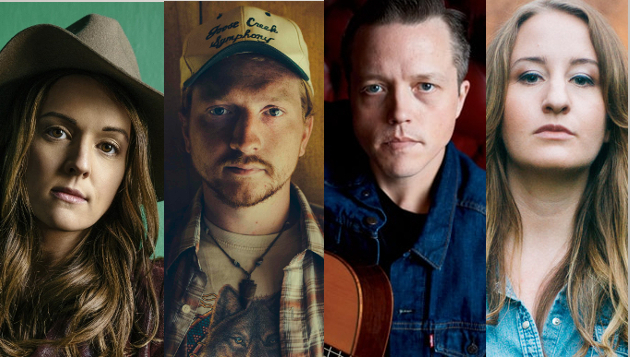 In a ceremony held at the Country Music Hall of Fame on Tuesday afternoon (5/15), nominees in six categories were announced, with four total nominations going to Jason Isbell, and three going to both Brandi Carlile and Margo Price. Most notable from the nominations is that both the Artist of the Year and Album of the Year categories only feature four nominees, where last year they featured five. Also, Jason Isbell, John Prine, and Margo Price were all nominated for Artist of the Year in 2017, as well as picking up nominations this year. John Prine ultimately won in 2017. Jason Isbell also doubles up on nominations by being considered for Artist of the Year, as well as receiving a nomination for Duo/Group of the Year with his band, The 400 Unit. The full list of nominees can be seen below, as well as a video of the entire nominee presentation. Winners will be announced at the annual awards show at the Ryman Auditorium Wednesday, September 12th as part of AmericanaFest. Generally, I like these nominations. But I don’t see the value in limiting Aritst of the Year, and especially Album of the year to just four nominees. With so many great albums out there these days, give a 5th project that distinction. It can’t hurt. Also, really feel like the Turnpike Troubadours got overlooked once again. They headlined AmericanaFest last year, and put out an excellent record. Better to give them a nomination, than double up Isbell both in Duo/Group and Artist. The 400 Unit also deserve recognition, but so does the Texas scene, which Turnpike could have represented, and kept Texas firmly in the “Americana” fold. Totally agree – Turnpike Troubadours should have been nominated to bring in the Texas/Red Dirt movement! Couldn’t agree more either re TT. Personally I think Tyler, though “emerging,” put out the best album so I hope he at least wins the category he is in. Jason will likely get artist of the year due to his increasing notoriety. Can’t complain too much though, all good artists, especially when compared to the CMA’s, etc. Then how will Anderson East be able to make it to the awards? Kidding but I agree though TT deserved recognition. Voting is going to be so hard this year. I’m so hoping Tyler gets it. I agree it would be great to have five spots though. Almost everyone I nominated was on the ballot though so I can’t complain. Is not familier with the emerging artists. But these folks know little or nothing about the folks I program in Western. They need to move the time of this award show because the nominations always feel so dated. Why only 4 nominees per category tho? I think there should be five, especially for Album of the Year, Artist of the Year, and Emerging Artist of the Year. No harm, and only good to have five nominees instead of four, especially how crowded “Americana” is these days. I don’t know the exact nomination process. Perhaps there needs to be a majority of support, or only four nominees are fielded. But I think bumping up to five is a very reasonable suggestion for the awards moving forward. The members can nominate up to 10 names in each category so five would make sense to me. It might be something the members could bring up for future years. I’m happy to. for an Emerging Artist of the Year award. But since she is nominated, I really really hope Courtney Marie Andrews wins it. How long do you think Tyler Childers has been touring? It’s not really a new artist award, but someone who is making waves and arriving. At least the way I view it, but WTH do I know. I don’t know but they are about the same age. So maybe as long as she has. And even if I hope she wins, I guess it will be Anderson East or Tyle Childers. I’m really surprised that Allison Moorer and Shelby Lynne were overlooked in favour of giving Isbell a nomination in the Duo/Group category when he’s already up for Artist of the Year. Agree, they overlooked 3/4 of the field. And I know Isbell is everybody’s darling and he can’t help that, but his recent stuff is his most uninteresting, imo – there’s much stronger material out there going unrecognized. Margo Price doesn’t belong anywhere near these awards. Her album this year was not good. And while Isbells album was good, Purgatory was a masterpiece. Also where is the love for John Moreland? His album last year was at least as good as isbells. Glad to see Nathaniel Rateliff on there tho. I don’t think enough people realize just how good “Tearing At The Seams” is. Seriously… where the hell is John Moreland? Big Bad Luv was excellent. That should have been the 5th nominee for Album of the Year. Who’s more Americana than Moreland? I’m saying this even as a fan of Margo Price. Purgatory was just flat out better. In every possible way. I’m also a fan of Margo Price. Going to see John Prine in couple of weeks and am excited that she’s opening, as I’ve seen her once before. I think AAM is a good listen, but it is not a great album (I thought MWFD was a great album). And Purgatory was my favorite last year. Another Margo fan here – I thought I was the only one on the site! I love MWFD and listen to it regularly. I enjoyed AAM, but I’ve barely listened to it again as an album. I get where she was coming from, but I think she rushed making it and the result is a half-formed idea of a political album that lacks the emotional punch and autobiographical interest of MWFD. I love Margo. You are not the only one! I loved Purgatory but I also loved her album. I am not an Isbell fan at all, I know everyone loves him, but I can appreciate his talent. Ty definitely should have been in album of the year, IMO. The AAM material really came alive when I saw her live. I was in the same boat with that album. I would have liked to see Caleb Caudle nominated for Emerging Artist. His Crushed Coins album is excellent. I really can’t get mad at any of these nominations. My only wish is that they would expand the nominee field to five for all categories. Enjoyed the show and its humor. Going to have to check out Milk Carton Kids now. Daniel Donato’s playing is so pleasing to the ear. Like the old country jazz stuff mixed with something else I can’t quite put my finger on. Molly Tuttle blows me away every time I see her play. They should have a category for best live band. Margo could take that one hands down. Her record, which I like, does not touch the energy of her live show. Me and my wife were both impressed with her live.. I’ve always been a Margo fan, but the show was better than I thought and really put my wife in her camp. 3 people are nominated in 3 of the top categories. This isn’t a perfect representation of Americana music, Americana Music Awards should know better. On a side note: Am I the only one who thinks that with the growing popularity of Americana Music there should be Male & Female categories? The members vote. So it represents the people the members voted for. I am one. I’m sure there are others here. A lot of musicians and industry members. You can always look into membership if you want to vote. i appreciate your response Gina. unfortunately i’m not an artist or in the industry. i know that i’m just complaining and that none of this should bug me and usually it don’t care but every once in a while i get a bee in my bonnet about it. artists shouldn’t get a nomination just because they’re a darling and that’s the vibe i’m getting here. i expect back patters out of the mainstream music awards but Americana should be more thorough. i don’t dislike all the names on the list. a couple i really enjoy and believe they genuinely deserve their nominations. some seem like they’re being nominated solely to put asses in the seats though or to give they’re buddies an undeserved atta boy. idk..just my two cents. Brandi Carlile is so much more dynamic than the rest. Also Tyler Childers could’ve been nominated in more categories, he’s that great.